Statistics Canada’s role is to ensure that Canadians have access to a trusted source of statistics on Canada that meet their highest priority needs. The agency’s mandate derives primarily from the Statistics Act. The act requires that Statistics Canada collect, compile, analyse and publish statistical information on the economic, social and general conditions of the country and its people. It also requires that Statistics Canada conduct a census of population and a census of agriculture every fifth year and protect the confidentiality of the information with which it is entrusted. Statistics Canada is also mandated to co-ordinate and lead the national statistical system. The agency is considered a leader among statistical agencies around the world in co-ordinating statistical activities to reduce duplication and reporting burden. Further information on Statistics Canada’s mandate, roles, responsibilities and programs can be found in the Statistics Canada 2011-2012 Main Estimates, available online at http://www.tbs-sct.gc.ca/est-pre/20112012/me-bpd/docs/me-bpd-eng.pdf. Statistics Canada has the authority to collect and spend revenue from other government departments and agencies, as well as external clients, for statistical services and products. This quarterly report has been prepared by management using an expenditure basis of accounting. The accompanying Statement of Authorities includes the department's spending authorities granted by Parliament and those used by the department consistent with the Main Estimates for the 2011-2012 fiscal year. This quarterly report has been prepared using a special purpose financial reporting framework designed to meet financial information needs with respect to the use of spending authorities. This section highlights the significant items that contributed to the net increase in resources available for the year and actual expenditures for the quarter ended June 30. 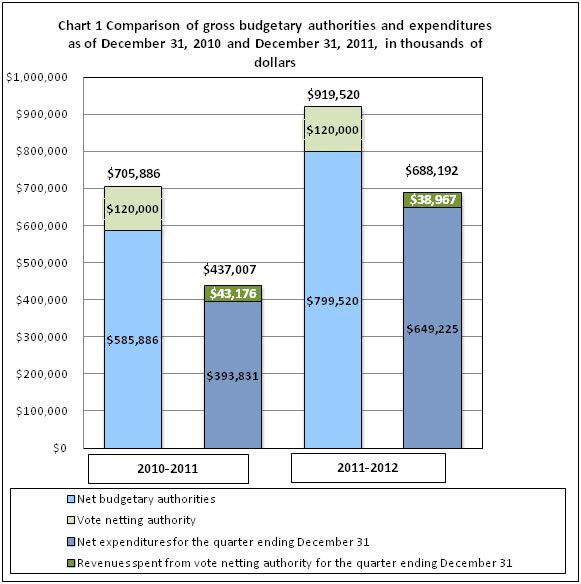 Chart 1 outlines the gross budgetary authorities, which represent the resources available, for use for the year as of June 30. Total authorities available for the year have increased by $178.9 million, or 26.2%, from the previous year, from $682.7 million to $861.6 million. This net increase is mostly owing to the 2011 Census of Population and National Household Survey ($162.1 million) and the Census of Agriculture ($8.5 million). The current fiscal year is the peak year for census-related activities. conducting evaluation studies of the 2011 Census Program to identify lessons learned and making recommendations for the future. In addition to the appropriations allocated to the agency through the Main Estimates, Statistics Canada also has vote net authority within Vote 105, which entitles the agency to spend revenues collected from other government departments, agencies and external clients, for providing statistical services. The planned revenue is stable for 2010‑11 and 2011-12 at $120 million. Total expenditures recorded for the first quarter, ending June 30, 2011, increased by $140.1 million, or 104.1%, from the same quarter of the previous year, from $134.7 million to $274.8 million, according to the Table of Departmental Budgetary Expenditures by Standard Object. Most of the increase in spending is due to census-related activities. Also, Statistics Canada has spent approximately 32% of its authorities at the end of the first quarter, compared with 20% in the previous year (Chart 1). Given that the Census Day was May 10, 2011, a significant amount of effort was incurred during the first quarter of the fiscal year. Standard Object 01, Personnel, shows a cost increase that is mainly due to additional public servants hired to conduct census-related activities. Standard Object 02, Transportation and Communication, includes the cost of the delivery and return of census questionnaires for over 15 million dwellings, resulting in higher postage and transportation costs for the agency. Standard Object 03, Information, is related to the census communications program implemented to support census collection activities, which increased advertising costs for the agency. Standard Object 04, Professional and Special Services, saw increased costs because of census collection activities: approximately 35,000 field staff were recruited and trained to follow up with non-responding dwellings across the country. Reductions in Revenues are primarily due to the timing differences between the two quarters for invoicing and project schedules for key deliverables. The financial risks associated with the Census of Population Program have lessened during the reporting period. Throughout the first quarter, the Censuses of Population and of Agriculture were proceeding, as planned, to achieve targeted response rates, on schedule and on budget. Initial results for the National Household Survey were much better than planned, despite the postal strike, which impeded operation. Collection of the National Household Survey will continue through July and into August. Statistics Canada has the authority to spend its revenues received during the year, representing, on average, 20% of the department’s funding. Of these revenues, approximately 80% come from other federal departments. However, other federal departments are faced with implementing budget restrictions such as cost containment and the strategic review. Consequently, there is a risk that other federal departments may reduce their purchases of statistical services and products: this would impact Statistics Canada’s available funding. To mitigate this risk, Statistics Canada is monitoring planned revenue levels on a quarterly basis, and is communicating with key federal departments to assess the impact of budget pressures on their need for statistical services and products. conversion to a cost recovery funding model for the Survey on Financing of Small and Medium-sized Enterprises. In contrast with last year, Statistics Canada is undertaking major activities this fiscal year that are critical to the success of the 2011 Census of Population and the National Household Survey. These activities include finalizing the equipping of field offices, hiring field staff, collecting data, follow-up with respondents, processing of returns, closing local census offices and processing facilities, developing and testing dissemination systems and processes, and starting data quality and evaluation studies. These activities culminate in the first of the census data releases, the Population and Dwelling Counts, in February 2012. Early enumeration of remote and northern communities started in February 2011, and was successfully completed in April 2011. The infrastructure required to conduct field operations was finalized, equipping and staffing five Regional Census Centers and 37 local census offices. Approximately 5,000 crew leaders and assistants were hired to recruit, train and supervise approximately 30,000 census enumerators who were hired for the period from May through mid-August. The Data Operation Center was opened and began processing returned paper and Internet questionnaires, with a total staff complement of approximately 1,200 employees. In areas with mail service, census letters or questionnaires were mailed in early May. The letters encouraged respondents to complete their census online, instead of using the traditional paper questionnaire. Reminder letters were produced and mailed to non-respondents. Door-to-door follow-up by enumerators started in May 2011 for the census and in June for the National Household Survey. More than 4 million follow-up cases are expected to be completed for the census by the end of July 2011. * Includes only authorities available for use and granted by Parliement at quarter-end.